I am currently a Postdoctoral Fellow at the Geophysical Laboratory of Carnegie Institution for Science. I’m a geochemist and experimentalist who seeks to understand the geochemical processes during planetary formation, differentiation and evolution, with a focus on the behavior of volatiles. I utilize a variety of analytical and experimental tools, as well as natural sample collections to solve intriguing questions in these fields. Before coming to the Geophysical Laboratory, I got my PhD in 2017 from the Department of Earth and Environmental Sciences at the University of Michigan, Ann Arbor with a John Dorr Academic Achievement Award. During my PhD, I studied Cu diffusion in silicate melts to understand Cu-bearing ore deposit formation and volatile isotope fractionation in tektites. I also studied volatile abundances in the lunar mantle by looking at lunar olivine-hosted melt inclusions. After joining Geophysical Laboratory in 2017, I’ve incorporated non-traditional isotope geochemistry into my research. My current research program aims at understanding planetary formation and evolution by experimentally studying isotope fractionation of Cu and Fe during related processes. 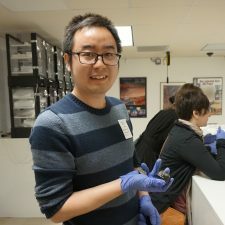 Logo photo: Myself holding a Martian and a lunar meteorite in one hand at the Smithsonian National Museum of Natural History, December, 2017. If you have any questions regarding my research or this website, please fell free to contact me with the information below.